Please note: Enabled USB drivers are required for Live Mode via USB and the USB connection from your PC to the device. 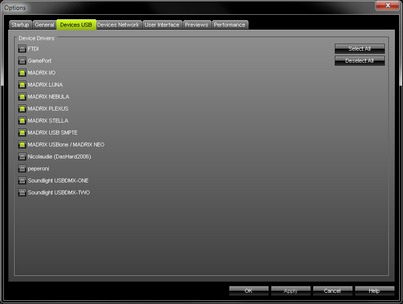 Please make sure to activate the driver for the USB connection in the MADRIX Options. To access the Options of MADRIX, first go to the menu 'Preferences' -> 'Options...' (or 'Ctrl+Alt+O'). Second, select the tab 'Devices USB'. Enable the 'MADRIX PLEXUS' driver and click 'Apply'. Close the dialog with 'OK'. Please note: Enabled network drivers are required for the Ethernet connection from your PC to the device. Please make sure to activate the driver for the Ethernet (network) connection in the MADRIX Options. To access the Options of MADRIX, please press 'Ctrl+Alt+O' or go to the menu 'Preferences' -> 'Options...'. Now go to the tab 'Devices Network'. Select 'Enable LUNA / NEBULA / PLEXUS /STELLA' and click 'Apply'. Close the dialog with 'OK'.